It would seem there are just as many articles about how to use Pokémon GO for retail as there are Pokémon GO players. The augmented reality game featuring a wide assortment of colorful pocket monsters (hence the name), has exploded in popularity since its recent launch. If you are a small business owner, store manager, or property manager then this is good news for you, too. Setting up “lures” at PokéStops. If you are lucky enough to have a PokéStop near your store then you are already at an advantage. The digital gods at Niantic have blessed you with a location suited for drawing traffic to your location. Alone, this is not enough. Telling people that you’ve dropped “lures” at your location. We’ve run Pokémon events at Phillips Place in Charlotte, NC, Market Common Clarendon in Arlington, VA, and Grand Ridge Plaza in Issaquah, WA. We used social media to alert our communities about the events, leading to high amounts of digital and physical traffic. Give your customers a reason to stay in your store, and not someone else’s. Just because you have a PokéStop near you doesn’t mean you are the only one. Why should a customer sit in your restaurant when the bar next to you is giving away free appetizers for any Pokémon caught on their bar-top? Think creatively with your offers and promotions. 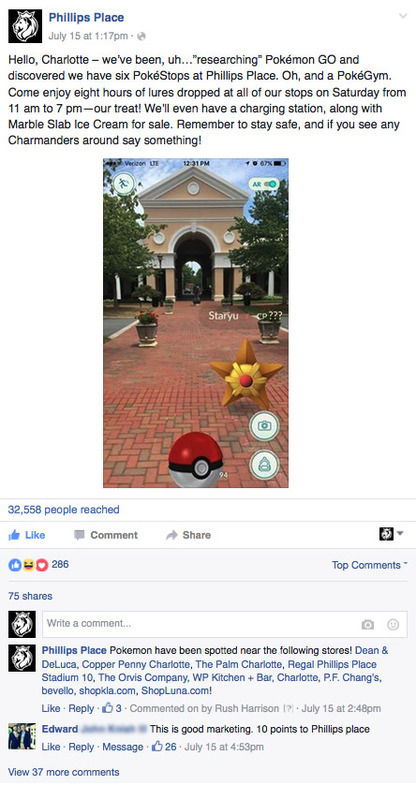 Get involved in your local Pokémon GO groups on social media. Your area likely has a local group dedicated to whichever team they belong. Do not try to advertise to them. Instead, offer up some friendly incentives for some friendly competition. Is there a nearby gym routinely controlled by Team Mystic? Offer up a discount to any members of Team Instinct or Team Valor if they are able to wrestle control away. Now you’ve enticed three groups at once to play for a reward at your location. You can post an image or icon of the team in-store as a trophy for whoever reigns supreme. No PokéStop or PokéGym near you? Request to have a site become one. Visit Niantic’s Support Page and go through the steps to have a nearby landmark, mural, historic site, or community hub be turned into a Poké-place of power. No one is sure how the game creator chooses its locations, but ensuring it is a place of significance will help. Show players that you care by being authentic. Don't use terms like “Poké-dude” or “Pokémans.” Learn the lingo and rules, and show an interest in this massive user-base that is sweeping the world. An entire generation of adults grew up on this game, and a new generation is being introduced to it. The Pokémon theme song. Most players and parents will know this by heart. Eric Davidson is Regency Centers' Communications Manager, and resident Poké-expert.